Hope everyone has had a good week! Mine has been interesting… We’ve been dealing with getting some water damage assessed and fixed in our house after a small overflow in an upstairs bathroom resulted in a family room waterfall through a spinning ceiling fan. Who needs Vegas and the Bellagio fountains? I had one in the family room! Anyway… I’m hopeful that next week will be a bit calmer! If you missed it this week, Johnn Four from Roleplaying Tips and Gamer Lifestyle interviewed me recently about my “Kickstarter habit” at the Gamer Lifestyle blog. It was fun to be on the response side of the equation for once and consider some tips for people thinking of starting their own KS projects. Enough about me… There’s tons of great links this week, so why don’t we just dive right in! Though I gave up doing New Years’ Resolutions quite a few years ago now, I know the beginning of the year is a time many reflect on the year prior and figure out what goals they’d like to set for the new year. Tracy Hurley (aka @SarahDarkmagic on Twitter) wrote a great article about her own goals for 2012 at the D&D blog. (Plus she was very kind and linked to an article on GKR!) I can get behind all of them, but need to “Live Healthier” and “Play More” myself. What were your resolutions this year? Did you read comic books in the 1980s? Then you probably saw these ads from TSR! Jason Shayer at Welcome to the Marvel 1980s scanned a few one-page mini-comics for D&D to remind some of us of our youth! I’ve been a gamer for a long time. And a geek for longer than that. So I have to say that I think I’ve heard damn near everything on this list of “S(tuff)* People Say to Roleplayers from WJWalton over at The Escapist. Among my favorites: “Are you a Satanist?”, “You actually enjoy making stuff up?”, and “So you have no concept of reality?” Ah yes… Haters gonna hate. Did you grow up in the 1980s and love the Thundercats? I’m not ashamed to admit I was. But here’s a source of art that didn’t make it into that original cartoon series from Rankin Bass. These great pictures are from artist Jim Meskimen and should provide inspiration for someone’s space- or fantasy- based campaign. There were some strange things on Thundarra my friends that we never saw! Game design is a tricky thing. So seeing Tracy “Rolling20s” at Critical Hits devote an entire article to open game design was terrific. Why did he open up the process? To alleviate his fears that the game sucked. The folks behind D&D Next should really listen to his advice. “Openness isn’t a cure-all” he says. But it’s a great way to get people involved from the beginning. For me, wizards have only had a few weapon choices… a staff, a dagger, and the occasional wand. So when DeadOrcs (RM Walker) at This is My Game put together an arsenal of sorts for wizards to consider, I knew I had to check it out… How could I have forgotten the good old rod, orb, tome, and familiar! Someone should take my geek card… Geez. Need some inspiration for an NPC? 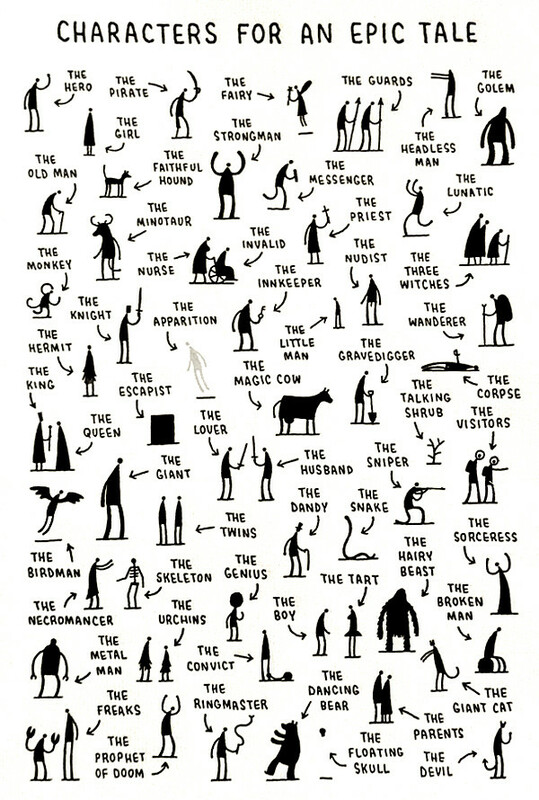 Check out Tom Gould’s “Characters for an Epic Tale” poster. This Reddit post from awesome_mccoolname has a link to the original, plus some great other resources to consider. And if you’re producing your own materials for sale or for free, you should check out Stargazer’s tips on how to get a good page layout. GREAT tips to consider. Did you ever wonder why one location is fantastic and another is just average? Well, Keith Davies kicked off a “Fantastic Locations” RPG blog carnival for January that has had some great articles to inspire you… Be sure to check out the latest round-up at Davies’ blog! Chris Hackler at Gaming Tonic hit on a key point recently that I hope is echoed by other gamers and bloggers. The “Edition War” as it has been called is largely a waste of time. If you don’t like a game system, don’t play it. It may seem “peacenik,” but can’t we all just get along, respect our differences, and agree to disagree once in a while without throwing around heavy words like “I hate 4E” or “I hate Pathfinder”? There are so many more systems out there now it’s more a matter of personal preference than anything. But as Chris states in his post – 5E Killed the Edition Wars (in his group) – and I think that’s awesome. Let’s focus on creating great content and having fun and not waste energy on a “war” that ultimately is meaningless. MTV Geek has actually impressed me the more I read, so I wasn’t shocked to see an interview of Mike Mearls by Matt Morgan about “D&D Next” pop up recently. Mearls is definitely in the thick of it, so I’m happy to see him (and other WotC staff) getting the word out and talking to people. This has to be the most press I’ve ever seen about D&D! What do you consider the key aspects of a character? Monte Cook suggests: Class (and level), Race, Ability Scores, and Customizable Elements (skills, feats, etc.). Though I have to admit those represent the character aspects required by D&D as a system, I think there are more things to consider like: concept, history, relationships – the esoteric qualities that make a character more than a collection of statistics on a sheet… What do you think? Sarah Darkmagic (aka Tracy Hurley) had some interesting thoughts at her blog about how she thinks skills should be approached in D&D Next this week, plus some ways of looking at skills that I hadn’t considered. I really like her idea of having a “continuum of complexity” with a simpler approach for new players, a mid-range approach for mid-range players, and the Full Monty for advanced players. Interviews rock, especially when they’re detailed and offer insights into how games come to be. The Secret DM had an opportunity to review John Holland, the creator of the Realms of Atlantasia Gamemaster’s Bible which has been in the works for nearly two decades. Why did it take 18 years to complete? Read on McDuff! Do you like The Order of the Stick? Yeah, me too. So I was geeked up when I saw that Rich Burlew, OotS creator, is trying to get some of his older books in print. And he’s doing it on Kickstarter – an amazingly successful one at that (nearly $200k so far!)! How about another interview? This one’s done by The RPG Guy with David Hill of Machine Age Productions. Great long interview with some terrific food for thought. My checkbook can’t handle all the Kickstarter projects I want to support. Check out Joe Wetzel’s (the guy behind Dungeonmorph Dice) latest project to create a library of stock art for all the creatures in the D&D 3.5 RPG SRD. That’s right – ALL the creatures. I need another job to support my gaming habit, dangit. Are you considering doing some freelancing for RPG games? I strongly encourage you to check out Brian Engard’s article on the topic at 2d6 Cents. It’s not all wine and roses, but can definitely be a worthwhile pursuit. He offers some good tips on keeping your reputation intact, responding to emails, and generally being professional about the whole thing. Good advice whether you try to become a RPG freelancer or not really! Rite Publishing just released 10 Luckbringer Feats for your Pathfinder campaign which includes ten new feats from the Luckbringer class in The Secrets of the Luckbringer. Raging Swan Press just released Cultists of Havra Zhoul by Pierre van Rooden. This GM resource offers a semi-secret cult supposedly there to fight crime and corruption, but may be rotten at the core… Is it too late to stop this organization from within? Purple Duck Games continues its run on great art with Bestiary III Stock Art: Yuki-Onna, which offers a mysterious Japanese spirit in multiple formats for your personal and professional use. I’ve been very interested to see what Paizo does with their new miniatures line, so was happy to see a review from Steel_Wind at ENWorld this week of the first set of Wizkids miniatures for the Pathfinder RPG. Though it sounds a bit expensive and like a bit of a packaging headache, he sounds pretty favorable overall and has hopes for the line. The Main Event at Critical Hits took some time to review a book from fellow Dickinson alum Daniel Polansky called Low Town. I like the concept of a noir/fantasy mashup, so may have to check out Low Town when I get a break in my reading pile. Sunglar at Stargazer’s World had some time to check out Kobold Quarterly #20 – the winter edition. As per usual, the Kobolds managed to throw a little bit in for everybody to chew on. I’m looking forward to diving into my copy soon! Andy at Little Lead Heroes had an opportunity to try a game with his son using the Pathfinder Beginner Box… Sounds like they had a great time improvising their way into and out of trouble… even if his son’s character died! Masks from Engine Publishing and the folks at Gnome Stew sits on my electronic bookshelf beckoning to be opened, so I’m always interested to hear what other reviewers have to say about it. This week Silveressa at Roleplaying Tips took a crack at it and finds it “a super addition to any GM’s toolkit.” I agree! The world of Golarion has been around for a few years and explored in various Pathfinder RPG materials over the last 4 or 5 years, but the Inner Sea World Guide captures the most information in a single source. Thorynn at Skyland Games took some time to peruse its 320 pages and seems to think it’s a pretty good investment whether you’re looking for some ideas about world building or running a Pathfinder campaign. I’m not much of a social media expert, but I have to admit to playing with Google+, Facebook, Twitter, Reddit, and other web tools on occasion. Robin Laws this week had some glowing things to say about Google+ and driving traffic to his blog. I’ve not seen the kind of growth he has, but then again – I’m not Robin Laws! And Jeffrey at Troll in the Corner posted a great collection of Pathfinder RPG tools (both online and offline) that you should definitely check out. That’s it for this week on the news front. If it wasn’t enough, be sure to check out the Bundlr links below as well as the Gamer Assembly’s “Weekly Assembly” and Chris Hackler’s (from Gaming Tonic) “What’s up with D&D” article at ENWorld round-ups from this week. Both are great sources of gamer info! Thanks for the mention! You’ve got a great news and reviews compilation here. Great site online he wealth of info on here – ill definetly be back! @Paul Johnson – Thanks for the compliment!